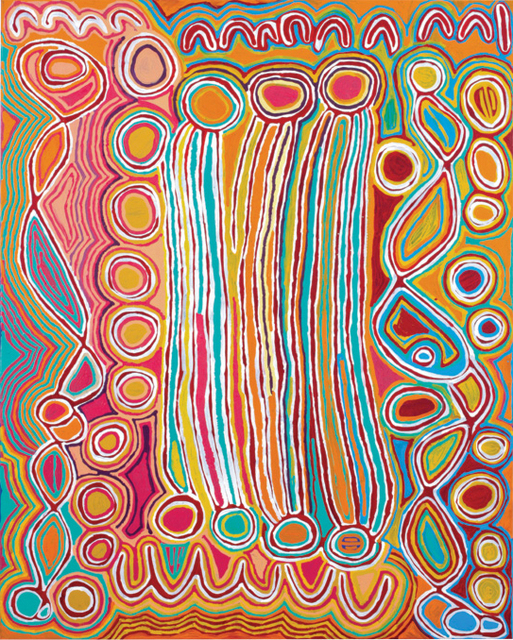 The country associated with this painting is Mina Mina, a place far to the west of Yuendumu, which is significant to Napangardi and Napanangka women, the custodians of the Jukurrpa that created the area. The Jukurrpa story tells of the journey of a group of women of all ages who travelled to the east gathering food, collecting Ngalyipi (Tinospora smilacina or snake vine) and performing ceremonies as they travelled. The women began their journey at Mina Mina where Karla-ngu (digging sticks) emerged from the ground. Taking these implements the women travelled east creating Janyinki and other sites. Their journey took them eventually beyond Warlpiri country. The central motif in this painting is the Ngalyipi vine, which grows up the trunks and limbs of the Kurrkara (Allocasuarina decaisneana or Desert Oak, ) trees. Ngalyipi is a vine sacred to Napangardi and Napanangka women and has many uses, including as a ceremonial wrap, as a strap to carry Parrajas (wooden bowls) laden with bush tucker and as a tourniquet for headaches.